From the friendly confines of venerable Wrigley Field in Chicago, it’s time for some Friday afternoon baseball under the sun, as the San Francisco Giants come to the Windy City to face the Cubs on Ladies Day. Out on the mound, we’ve got all the makings of a pitching duel between two of the National League’s best, Juan Marichal of the Giants and Ferguson Jenkins of the Cubs, although both lineups are packed with power up and down the batting order — in spite of the absence of Bobby Bonds for the Giants and Ernie Banks for the Cubs, both of whom are out with leg injuries. Despite lacking Bonds in the lineup, the Giants are formidable with Willie Mays in center field, Willie McCovey at first base and Kenny Henderson in right. The Cubs’ lineup includes Billy Williams in left field, Ron Santo at third base, and the solid double-play combo of Glen Beckert and Don Kessinger. Even without Banks, who entered baseball’s Hall of Fame in 1977, the game features no less than seven future enshrinees: Mays (elected to the Hall in 1979), McCovey (1986) and Marichal (1983) for San Francisco, with Williams (1987), Jenkins (1991) and manager Leo Durocher (1994; he also piloted the Giants in New York from 1948-55) representing the Cubs in Cooperstown. Up in the Wrigley broadcast booth for the visitors are a pair of Hall of Fame voices, Russ Hodges and Lon Simmons, who have been partners at the mike since the team moved west from Manhattan in 1958. Immortalized for his fabled call of “The Giants win the pennant! The Giants win the pennant!” as Bobby Thomson homered to defeat the Dodgers in a playoff to determine the National League champion in 1951, Hodges was honored with the Ford C. Frick Award (symbolizing enshrinement in the broadcasters’ wing on the Hall) in 1980. Born in Dayton, Tenn., in 1910, his family moved to Covington, Ky., across the Ohio River from Cincinnati, when he was ten years old. He attended the University of Kentucky on a football scholarship and later studied law at the University of Cincinnati, before beginning his broadcasting career as an announcer — spinning hillbilly records and doing sports reports — on WCKY in Covington. In 1932, with Hodges at the mike, WCKY began broadcasting Reds games from Crosley Field and, in 1933, he graduated from law school and passed his bar exam. Earning $25 a week as a baseball announcer at the height of the Depression — when most attorneys scrambled to make that much in a month — helped Hodges seal his decision to remain in radio. After WLW (which was owned by Powel Crosley, who also owned the Reds) became the team’s exclusive station in 1934, he went to the minors, making $30 a week announcing for both the Rock Island Rocks and the Davenport Blue Sox of the Three-I League; in less than a year, he landed at Chicago’s WIND, doing Cubs and White Sox baseball, as well as football, basketball and boxing. In 1938, he moved to Charlotte, N.C., where he did 154 Washington Senators’ games each season for four years via telegraphic recreation, which led to his hiring by the team in 1942 as its play-by-play man in the nation’s capital, a deal which also allowed him to also become the voice of the Washington Redskins. With Mel Allen, Hodges became one-half of the New York Yankees’ broadcast team in 1946, then, after three seasons, became the lead voice for the New York baseball Giants. 1970 was his last full season in the broadcast booth for the Giants; suffering from cancer, he was given a position in the team’s public relations department in 1971, while working occasionally for KSFO, the Giants’ flagship station. On April 19, 1971, he was stricken with a fatal heart attack at his home in Mill Valley. Hodges’ longtime play-by-play partner, Lon Simmons, was an all-around sports star at Burbank High School before attending USC on an athletic scholarship. Injuries derailed his promising career as a pitcher — he played in the Philadelphia Phillies and Boston Braves farm systems — which led him into sportscasting, working his way through stops in Marysville and Fresno before receiving his call-up to the majors as sports director of KSFO in 1957, where his first pro assignment was with the 49ers. With the 1958 arrival of the Giants (and Russ Hodges) in San Francisco, he began a lengthy association with the team as play-by-play man during three different tours of duty: 1958-1973 (retiring upon the death of his first wife), 1976-1978 (following the team’s departure to KNBR) and 1996-2002, spending 1981 through 1995 in the Oakland A’s broadcast booth with former Giants mikemate Bill King. For the many years of enjoyment they brought to Bay Area sports fans, both Hodges (2008) and Simmons (2006) were honored with induction into the Bay Area Radio Hall of Fame. The third man in the booth today for the broadcast is Bill Thompson, who also made the leap from Fresno to San Francisco and the Giants. A friend of Simmons’ from their days at Burbank High, Thompson was an advertising salesman at KMJ/Fresno when the station manager asked him to fill in on a daily fifteen-minute sports report. 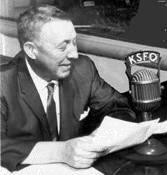 Following in Simmons’ footsteps, Thompson segued into play-by-play for the minor-league Fresno Giants and on Fresno State University sports on KMJ; both jobs had been handled previously by Simmons in the mid-1950s. * Invited into the booth for a Giants spring training game in Fresno in 1965, Thompson was allowed to announce a few innings, which led to his being hired as the third man on the big league club’s broadcasts. At first, Thompson only gave updates of scores from around baseball during games; later in the season, in an act of remarkable generosity, Hodges gave up one of his innings — the sixth — to Thompson. Following Hodges’ retirement, Thompson became the number two man in the booth alongside Simmons. After eleven seasons with the Giants, Thompson returned to Fresno in 1975, working in radio until becoming general manager of the Fresno Giants in 1978. He was named California League Executive of the Year twice during his eight-year tenure as the team’s GM. He died in Fresno at age 79 in 2003. * — The Fresno Giants were known as the Fresno Sun Sox during Simmons’ tenure as the team’s radio voice. NOTES ON THE AUDIO: This recording begins with the beloved “Giants Theme (It’s Bye-Bye Baby),” which served for many years as the overture to the team’s broadcasts on KSFO; the theme was edited onto the recording by the Bay Area Radio Museum staff. The audio on the game recording itself is poor to average at its very best, and was processed and normalized by the museum staff to achieve a fair level of quality. Commercial spots had been edited out of the original recording prior to its acquisition by the museum, although several KSFO station identifications remain within the body of the broadcast. For the record, I originally taped the game on an old reel-to-reel Sears tape recorder at 1-7/8th speed. I was finishing my final year at San Francisco State and decided to tape the game because I have always been a Russ Hodges fan and a rooter for both the Cubs and Giants. Jon Miller of the Giants can verify my recording … He had an engineer in Baltimore transfer the old reel-to-reel tape to audio cassette in the 1990s. I have had the honor of working at KQED from 1970 through early 1992 and had worked a number of Major League Baseball games with Jon, Ken Coleman and Bill King as a statistician and scorekeeper. We are grateful to John Bamberger for having the foresight to record Russ and Lon on the air. 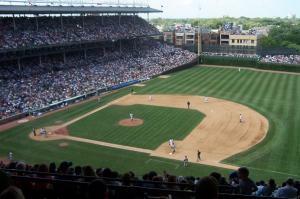 Now, let’s head out to Wrigley Field in Chicago for today’s game!